The following are excerpts from book reviews submitted by undergraduate students in the Journal Editing class that was offered by the Department of English at Caldwell University in the Fall 2017 semester in conjunction with the submission period for Presence 2018. The books reviewed below represent the students' choices from among the books reviewed by professionals in Presence 2018. Poets reviewed are: Maryann Corbett; Mary Di Lucia; a collection by Christine Higgins, Ann Lolordo, Madeleine Mysko, and Kathleen O'Toole; Derek Mong, Lois Roma-Deeley; Jeremiah Webster. 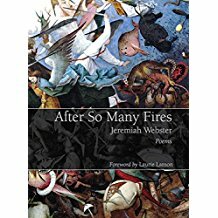 In diction that is not at all complicated, Jeremiah Webster's debut collection, After So Many Fires, creates a very realistic and genuine voice responding to the Yeatsian vision of the world's "falling apart." Employing a wide variety of images from contemporary domestic life to the vast beauty and mystery of nature to technology to allusions to classical and medieval literature, Webster's poems invite readers to see the importance of having faith in an afterlife and our soul's ability to survive and achieve a "second life" as we "build [our] home" in this one. I'm a child of the seventies. A lead paint, rickety stroller, open socket, Lysol survivor. Here he seems to have shrugged off the fact that he just killed a whole nest of hornets just a few lines before by using the simple fact of when he was born and grew up to defend his thoughts and actions. However, he does not necessarily condemn the ecological argument as he attempts to justify killing a colony of hornets. Having grown up in the 1970s, with what were commonplace items and ideologies that are now considered harmful, the speaker nevertheless leaves readers to consider how the human spirit was created to "survive" the harmful in both nature and culture. Preceded by her collection, Mid Evil, which won the 2014 Richard Wilbur Prize, Maryann Corbett's 2017 collection, Street View, continues to explore the past as it influences the present, merging traditional motifs and forms with images from contemporary life. Amidst walking tours as well as train, bus, automobile, even garbage truck, rides, Corbett's speakers take readers on a journey or quest for truth and beauty, viewed from the "street." In "Historic District, Walking Garden Tour," the speaker muses on the great length of time it took for the natural beauty of the neighborhood to come into its current state of being: "By boxwood aisles (a century to grow them) / owners are grandly framed, so that we know them / and listen." The magnificent "houses" on this tour are described as lovely "treasures of the Gilded Age," and yet, the touring speaker does not miss the irony of the "nineteenth-century greed" that "undergird their granite" and her own partial complicity in paying for a "ticket" that will perpetuate this opulence. The "views" along Corbett's journeys in this collection are not limited to historical settings. She also takes us along for rides in contemporary everyday life. Poem I of "Alternate Routes," aptly placed in the "Transports" section, conveys the modern feel of the entire book. Commuters on the "94 express" are compared to "pilgrims;" their "forward-facing seats," to the "pews" of a chapel, in which they "meditate" on "book, / the screen, the earbud. This is their retreat / inside freeway soundwalls' pearled concrete." Here the speaker comments on the stretch of time during travel, one that, in the modern age, is filled with empty space. There is no longer the long trek by horseback or the family unit filing into a horse-drawn carriage. Instead people are alone, inactive during transport. They are, quite literally, left to their own devices, and the poem uses the language of technological device to convey how contemporary quests take place on cell phone screens, iPods, or even still an actual book. The commuter-speaker of this poem concludes by observing that the other passengers are "not amazed" when the train emerges from the tunnel and "the skyline, jewel-faceted, / glitters," and readers are left with the question of whether our lack of communal experiences has desensitized us to the beauty and mystery of the world. Mary Di Lucia's debut collection of lyrics and lyrical prose, Accompaniments, is a response to Igor Posner's simultaneously published Past Perfect Continuous, a collection of black and white photographs, that largely consists of individuals, families, and outdoor objects. While Di Lucia's poems can stand alone and be interpreted in endless ways apart from the context of Posner's visual works, there is much value in looking at how Di Lucia's poems add story and emotion to the visual images. Her poems give the pictures, even the ones of inanimate objects, a voice, with language that helps make the story in each come to life. There are no explicit references to Christianity in the collection, but the pieces leave open the possibility of interpreting them, for example, in sacramental terms. A piece called "To Be Consumed" raises the question of whether our daily bread is "enough" to sustain us, physically but also spiritually. Here a man settles down to eat a loaf of bread. He is initially exuberant about the seemingly "boundless" quality of the "bounty." But before he is even halfway through the loaf, he "pauses" for a "moment," but does not want to allow any doubt to "weaken his belief in its enoughness." His pause allows readers to pause and wonder how the inevitable last bite will affect his faith in the loaf. "His last bite--is it really his last? He makes it into two separate pieces, respectable in size, neither of them too small, but neither sloppily, carelessly generous as before." Yet despite his attempt to make the loaf last infinitely, he does eventually question "How could it not be enough?" even as he thinks rationally that "tomorrow there will be another one" and ends with the infinite questions: "When will there be enough? When will it be enough? When will he be done?" His reference to the "last bite" and his breaking it into "pieces" invites readers to think of Christ's Last Supper, when He broke the Bread that could be shared an infinite number of times and instituted the recurring Eucharistic celebration to sustain us until the hunger of our bodies and souls will no longer be felt. Lois Roma-Deeley's recent collection, The Short List of Certainties, provides readers with an attitude with which to face the uncertainties in this life. In "Materializing in Another Life," her persona points out the irony in envisioning a better life in the next world, but doing nothing about improving our lives in this one. Hopes of one day "I'll be smart enough. Sister, you'll be thin enough" are often thought of, but never achieved. As human beings, we waste too much time wishing to be better, but the sad truth is that we do not do anything to change. We allow the "heart to grind against itself" and not stand against obstacles. In "Thirty-Nine Ways to Screw Up," the voice explains that we "hate" ourselves; we try to "[e]xplain to perfect strangers why [we] could have done x but didn't do x though [we] knew in [our] heart of hearts that if push came to shove [we] would have done x." The only limitations that we have in this life are ourselves. Stop making excuses and "hating ourselves" and do what we are capable of doing, which is a great deal. The prevailing attitude in Roma-Deeley's title poem, "The Short List of Certainties," is praise for having courage. In the face of sadness and want, "do not calculate the cost" is her imperative, calling us to have "courage" to write on the "list of certainties," however "short" it is, in a tone that "sounds very much like praise." The human mind is a very powerful thing. Often we are persuaded by our emotion, and we become victims of it. If we think that we can't, we surely will not get there. If we think we can, then surely we have the courage to give a fighting chance. Another life will not matter because we only have this one, and we should make the best of it. In many ways, we may "screw up," and society will judge us and try to force us to "materialize another life," but with "the short list of certainties," we can "Hope" to overcome the limitations of this life. In the Margins: A Conversation in Poetry contains the work of four female writers who have been writing together for over twenty years. The book contains the wisdom gained by these women across the span of their lifetimes and aims to guide readers towards spiritual hope, despite great loss, from personal losses of spouses and fathers to public losses, like that of Rev.Vernon Dobson, a Baptist minister and Baltimore civil rights activist. The poems in this collection do not romanticize the aging process, but instead use honest imagery related to the suffering of old age. In Higgins' "Empty Pockets," the speaker thinks of her loved one, whose health in deteriorating in a health facility. She describes him in undeniably realistic terms: "head falling forward in sleep, / leathery skin, swollen ankles, / empty pockets, shoes unlaced." She expresses the pain of watching "people brushing past" him with their "faces turned away," but concludes the poem with an ultimate sense of hope by revealing to readers the man's indomitable sense of humor, when he rises from his wheelchair and turns to her, his visitor, saying "Come on. Get in. / It's your turn." In O'Toole's poem "Marching to Zion," the speaker mourns the loss of Rev. Vernon Dobson's "voice, booming through the congregation's / hymnody at a public assembly, marching us to Zion" and the loss of his "scathing insight" that "carved six pounds of hubris from some politician's hide." But despite the congregation's sorrow over the "injustice" of the loss of their leader, the poem ends with the idea that the reverend's wisdom had been preparing them for the injustices that they would witness "on the streets of Baltimore." Unlike Derek Mong's first collection of poems, Other Romes, which contains original work, his second, The Ego and the Empiricist, is a book of adaptations, not translations per se, but works written to adapt the poems of Latin and neo-Latin poets from long ago in new and innovative ways. This book is meant to show us works that have gone forgotten and, like Other Romes, continues to convey the intersection of philosophy and faith. The religious faith seen in Mong's adaptations seems to spring from his choice of keeping alive works written in time periods when faith was intimately connected to art. Mong at his core wants readers to look inward in order to find a deeper meaning in life, playing with the ideas of death, life, spirit and mixing them with faith, sometimes overtly and sometimes subtly. this little song whispered on the gallows. He seems to view death here as his spirit's escape from the earthly shackles of his body, speaking in a way that disconnects the spirit and the body like in ancient Greek philosophy. Here the one responsible for his death, the hangman, is depicted as feasting "under" or being sustained by receiving God's approval, as seen in the reference to the "church bells." He makes readers think about the spiritual role that death has in life and the role God has in the event of our death. Our freedom is only fully realized when we die. However, while faith remains a focal point in the collection, some poems lend themselves more to a purely philosophical interpretation. For example, "The Coming of the Honeyed Age" uses the language of the farmland to say that we are not defined by what came before us. We find our meaning in the now, and meaning in the future will be "separate" from it. This poem ends with the image of a family's third generation, as seen in the speaker's use of his "nephew's children," who "separately, . . . thrash / pasture you begat / then sweeten their teacups. / / We reproduce and undo you." Mistakes that were committed by our ancestors can be undone and fixed by us and the coming generations.